Foucault’s essay “What is an Author?” begins with an outline of two themes of writing: First, writing is a process of “creating space into which the writing subject constantly disappears.” Second, writing inevitably kills its author. I want you to keep these ideas in mind, because even though Foucault moves beyond them in the essay, those two concepts loom over PunisherMAX. Anyone familiar with The Punisher should be aware of his war journal. The concept was used as a framing device and narrative method in various Punisher comics over the past thirty years. The basic conceit is that Frank Castle’s internal narration, which is what the reader would see in caption boxes, is actually just pieces of text excerpted from his “war journal.” What the reader gets is what The Punisher writes down–everything is filtered through that lens. We can immediately pick a few things out. First, the war journal is inextricable from the war itself. It is both a record and a means of sustaining the war–it is day 12,978, after all, which means that Frank Castle’s war went on for 35 years. Second, the journal is a way of marking all memory, not just accomplishments, victories, or defeats. The memory of his wife is imprinted there. Every adventure and every hit that Castle ever made are recorded there. It, more than anything else, is the sum total of The Punisher’s accomplishments, and for the comic book reader, The Punisher and the work of the Journal are one and the same. This is Foucault’s argument about the idea of the “work” that the author creates. What is the dividing line between “non-work” and “work” for The Punisher? If every action is toward his goal of “making the world sane,” and all of those actions are written in the war journal, then that means they are the same; the war journal creates the author called The Punisher who authors the war journal. In saying this, I seem to call for a form of culture in which fiction would not be limited by the figure of the author. It would be pure romanticism, however, to imagine a culture in which the fictive would operate in an absolutely free state, in which fiction would be put at the disposal of everyone and would develop without passing through something like a necessary or constraining figure. . . . I think that, as our society changes, at the very moment when it is in the process of changing, the author function will disappear, and in such a manner that fiction and its polysemous texts will once again function according to another mode, but still with a system of constraint–one which will no longer be the author, but which will have to be determined or, perhaps, experienced. I think that both of these concepts play out in shared comic characters like The Punisher. The character of The Punisher is not attached to any one author, but is rather available for anyone who writes in the world and character of Frank Castle. He is shared by a large, diverse group of writers and artists who all write and draw him at once. The “system of constraint” is cultural-reader based, in that there are certain limits that The Punisher could brush up against, places where the fiction cannot go because it cannot exist there–for example, The Punisher would never fly around in space with laser vision. That isn’t a limitation on discourse by some authorial spectre, but a broad assumption/assertion by the entire community formed under the banner of The Punisher–it is a social constraint. So to reformulate what I wrote above: Garth Ennis and Jason Aaron and about ten different artists wrote Frank Castle who wrote a war journal which wrote The Punisher. All of these are interrelated, and cannot be extracted from one another, so why does this happen? Nick Fury, in attempting to protect his friend, erases the life of The Punisher from the fictive world. Only we, the readers of the comic book, know the whole story. 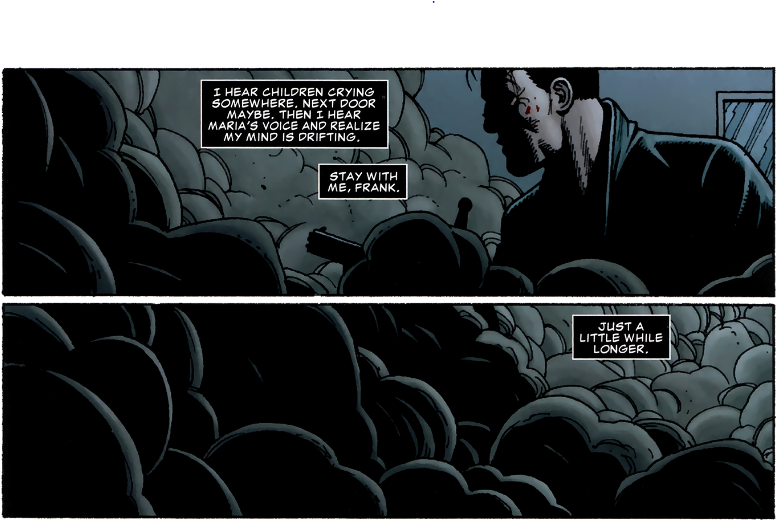 The narrative method that lays out The Punisher’s world is annihilated on the page. The war journal, which narrates to the reader, checks against this insanity. The reader should, at this point, be fully aware of the slow decline that Castle’s mind has undergone over the past ten years of his life. To a reader of the war journal, it makes sense; the journal provides a depth that makes us understand that Frank Castle is less of a hero and more of a man with a sickness that will never get better. In the moment that The Punisher is no more, the symbol is taken up by new people. It becomes a way of expression a dissatisfaction with the world that can only be alleviated with punishing violence. Everyone with a bone to pick becomes The Punisher. But the violence that these people partake in is not a war, not an attempt to correct systemic problems in unfairness, but rather a vent, an explosion, a riot during the death of the sovereign. They can only mimic the mass murdering tendencies of Frank Castle at his most violent and most ill. They replicate the ghost of a killer. This is the same issue that we have in real life. Putting on a symbol to justify committing acts of violence with no reflection is a horrific tendency–a badge, a flag, and even The Punisher symbol have all become part of justifications for killing people outlined as an enemy. At the moment the war journal is erased, at the moment when we are not aware of the reasons for violence, violence becomes meaningless. It becomes mass murder, not justified punishment. 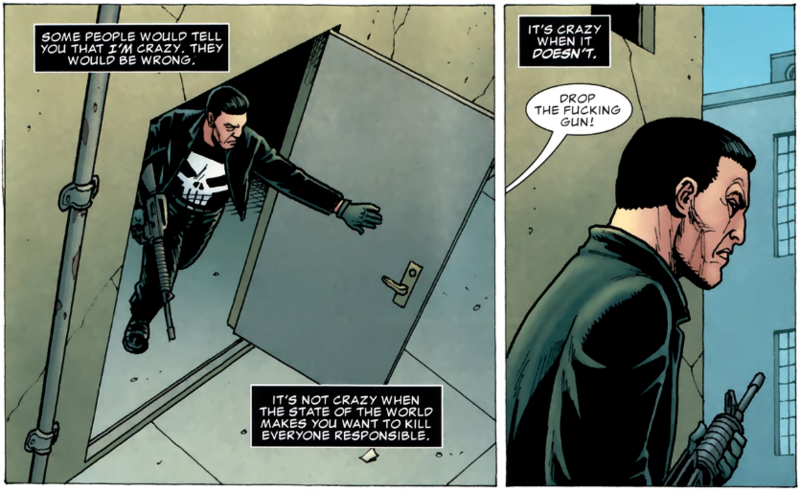 So Foucault is right about an author–Frank Castle, a writer who recorded every moment of his life, limited the amount of violence that could be done in the guise of The Punisher precisely because he provided a limit for the semiotic presence of The Punisher. The war journal becomes a cautionary tale. The symbolic function of the fiction that is The Punisher kills the cautionary, biographic pain of Frank Castle. 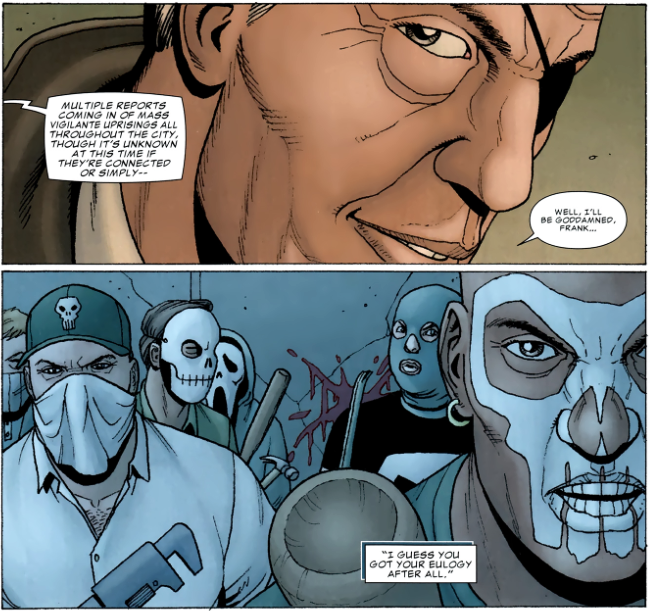 The death of his wife and children disappears in a haze, and only skullfaced men with pipe wrenches remain. So the writing subject is disappeared, in a Soviet way, and the author is dead. Without these referents, the symbols reign free without a sovereign. And it is terrifying. This entry was posted in Comics, General Features and tagged comics, foucault, jason aaron, marvel comics, the punisher. Bookmark the permalink.